The light novel industry in the West is currently dominated by isekai stories, so it can be tough to find anything else – much less something of high quality. 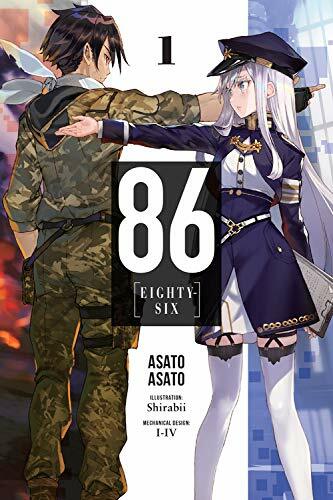 Thankfully over the last six months, publishers have been making an effort to localise titles from other genres, and today I’m here to review one of those releases: 86 Volume 1. Is it worth your time? Let’s find out! Beyond the walls that keep the citizens of the republic safe is the eighty-sixth sector, home to those stripped of their humanity and forced to work as the true pilots of the Juggernauts. When the war first broke out nine years ago, the government stripped anyone of Colorate descent of their civilian rights and branded them the 86. They went on to be considered nothing more than pigs, and when the Republic was unable to create unmanned drones to match the Legion ,the 86 were made to pilot them instead, used as disposable weapons for the Republic. This brings us to our secondary protagonist, Shin (also known as The Undertaker), an 86 who is the leader of the squadron Lena has just been put in charge of: Spearhead. Officials like Lena never see the battlefield. Using an advanced device known as RAID, government officers are able to ‘resonate’ with the 86 on the battlefield to give them commands and directions to fight off the Legion. The RAID allows a user to share the hearing, sight and sometimes feelings between those connected, but there are strict guidelines for its use. The 86 are resentful of those who live peacefully behind the wall while they are sent to their deaths, and the army sees the 86 as nothing but weapons. In such a war-torn world, will things ever change for the better? Despite the racism-filled Republic that Lena lives in, she’s one of the few people who regard the 86 as human, grieving for their deaths and wishing to prevent any meaningless loss. When she’s transferred to oversee Shin’s squadron, she vows to protect these young people and do her best at her job. Shin is anything but grateful to have such a meddlesome handler, but over time the two begin to develop a bond of trust that might be able to overcome their cultural differences. The 86 sounds like a war story but it’s actually more about the people than the fight between the Republic and the Empire. When we join Lena and Shin’s story, the Empire is already believed to have fallen, with just the Legion remaining. It’s thought that within two years the Legion will shut down due to an in-built timer, so the Republic just needs to hold out until then. That doesn’t make life on the battlefield any easier for the 86, but it does mean that the story can focus more on the politics of this world than the war. 86 is a look at what racism can do and how it destroys people and societies alike. There’s a lot to take in over the course of the 250 pages but author Asato Asato weaves it together wonderfully. I’m not a big fan of war stories or mecha series, but 86 captivated me with its characters and world building in a thought-provoking way I wasn’t expecting. The story hangs together well, the characters have depth, and it’s all well thought-out, from beginning to end. For example: Lena and Shin are characters coming from two completely different backgrounds and upbringings, yet they’re given ample time and development to be fleshed out. There were no plot holes with them or the plot itself and that left me wanting more. As I reached the epilogue, I felt satisfied with my time spent with 86: the story, the lessons it imprinted, and answers I was given. This brings me to my one minor concern for 86. 86 is not a standalone book, it’s an on-going series. However, this first volume feels perfectly written to be a one volume story, and the fact it’s not worries me. The foundation of the plot has changed a lot by the end of this entry and I’m concerned that future volumes won’t be able to live up to its high quality. Having said that, I think the fact this book reads so well as a single novel means you could likely just read this one and then stop if you chose to. 86 has been brought to the West thanks to Yen Press and has been translated by Roman Lempert. The translation reads well and appears to be problem-free. I was especially fond of the use of so many different fonts for when Lena and the 86 were communicating. It was easy to differentiate who was saying what without having to fall back on ‘he said, she said’. There are currently six volumes of the series out in Japan and Yen Press have the second volume scheduled for release in July. Illustrations for the series have been handled Shirabii (The Ryuo’s Work is Never Done! ), and while I’m a fan of the character designs, the illustrations were somewhat disappointing. Most of them simply depicted Lena or Shin in various states of emotion and I feel that there were better scenes that could have been represented. It’s also worth mentioning that Shirabii didn’t handle the mechanical designs, such as the Juggernauts. Those were instead drawn by I-IV and they all look fantastic. Each robot is given a detailed page explaining the inner workings in ways that the light novel’s story itself doesn’t always do. Overall, 86 Volume 1 is a superb read and highly recommendable to everyone. It’s thought-provoking, emotional and incredibly difficult to put down. It’s a perfect start to what I hope will be a great series, but even if it’s downhill from here I won’t be forgetting Volume 1 anytime soon.